Fourth And Final Esoteric Reissue Of The Move Rocks! 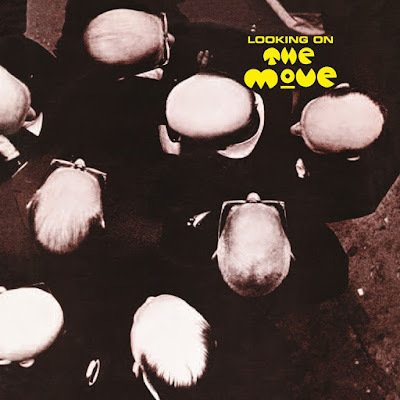 November, 1970, marked the release of the third album by The Move “Looking On.” This marked the first LP to feature ex-Idle Race guitarist/vocalist/pianist/songwriter Jeff Lynne, who replaced lead vocalist Carl Wayne. The band’s sound changed as “Looking On” featured five Roy Wood compositions and two by Jeff Lynne, the first album to include only original compositions . As with its predecessor “Shazam” the album features the band continuing to grow musically as evidenced by their extended, more complex performances. “Looking On” opens with the title track, a heavy tune written by Roy Wood and featuring the dual guitars of Wood and Lynne. Rick Price and Bev Bevan pound out the beat as Lynne’s guitar gives the song a nice melody while Wood’s lead guitar roars. Sounding not unlike Black Sabbath at its best, the song’s heavy riff is complemented by Wood’s sitar and Lynne’s piano on this nearly eight minute tune. “Turkish Tram Conductor Blues” opens with Wood’s guitar wailing before the band settles into a heavy groove. Wood’s vocals are simply gorgeous. An incredible guitar solo is joined by Wood’s oboe to give the tune its texture before Roy’s slide guitar drives the song home. “What?” is the first Jeff Lynne penned title, another heavy tune, with great guitar work by Wood and gorgeous, heavily echoed lead vocals and piano by Lynne. Wood’s cello gives hints of the music recorded by Wood, Lynne and Bevan later, as ELO. Wood’s guitar solo aided by his wah wah pedal is amazing, while Bevan’s drums stand out on this seven minute track. Wood’s slide guitar opens “When Alice Comes Back To The Farm” which also features Wood’s cello and Bevan’s percussion. Another incredible guitar solo by Wood is accompanied by Lynne’s piano. At the three minute mark Wood’s guitar takes over completely steering the song to its conclusion. A real change of pace, Lynne’s “Open Up Said The World At The Door” is much mellower with Wood’s sitar at the fore, while Lynne’s piano is reminiscent of Traffic’s Steve Winwood. Wood’s oboe is added for flavor, while Bevan’s drum solo is phased and quite interesting. Wood’s guitar solo is simply stunning. “Brontosaurus” is an incredible piece of hard rock, with Wood’s lead guitar line soaring over the heavy beat of Price’s bass and Bevan’s drums. Wood’s acoustic guitar enters, followed by an amazing slide guitar solo joined by Lynne’s pounding piano to play the song out. “Feel Too Good” a gentle tune, features Wood’s slide guitar and gorgeous vocal harmonies in addition to tasteful piano and drums by Lynne. The band settles into a mellow, Traffic “Low Spark” type groove aided by P.P. Arnold and Doris Troy’s beautiful vocal harmonies and Lynne’s piano. Wood’s guitar takes over half way through this tour de force before Lynne’s piano joins in leading up to more of Wood’s slide guitar. As a coda “Do Wop” vocals and gentle piano bring this nine and a half minute tour de force and album closer to its conclusion. Disc one of this set closes with its first bonus track, the Rick Price penned “Lightning Never Strikes Twice” a non-LP b-side which relies on Wood’s acoustic guitar to lead the way until he switches to sitar for the remainder of the tune. Disc two contains four outtakes and rarities from the “Looking On” sessions and nine BBC recordings, including interviews with Roy Wood and Bev Bevan, a total of thirteen tracks with a run time of just over 47 minutes, almost exactly the same as disc one. Compiled for Esoteric Recordings by Mark Powell this deluxe edition of “Looking On” has, in addition to its 14 bonus tracks, a 20 page full color booklet, with an essay by Mark Paytress, complete track annotations, tons of incredible photos and 24-bit remastering by Ben Wiseman, making this by far the best sounding and most definitive version of “Looking On” ever released. To top things off, the set includes an interesting mini-poster for this reissue with news clippings and even more wonderful photos on the reverse side. This release completes the four title reissue campaign by Esoteric Recordings of the pre-EMI Harvest catalog of The Move. All four are essential to lovers of mod and psychedelic rock and I truly cannot recommend the entire series highly enough. Obviously a labor of love, my hat is off to Mark Powell, his wife Vicky who helped compile the series, Ben Wiseman for the incredible sound and the folks at Esoteric Recordings for releasing this incredible series on this most treasured band. Cheers!